Brixton 1983 by Caroline Thorp & Mick Harrison. Household Paint. Celebrating London's Last Remaining Inner City Windmill! Located just off Brixton Hill is the Brixton Windmill. Built in 1816, it has stood the test of time as the local area went from quiet countryside to a suburb of the city to an urban sprawl. In 1983, to brighten up a small part of the Blenhiem Gardens Estate and to mark the important history of the windmill within the local community, it was decided to paint a mural. The artwork was designed by muralists, Mick Harrison and Caroline Thorp. 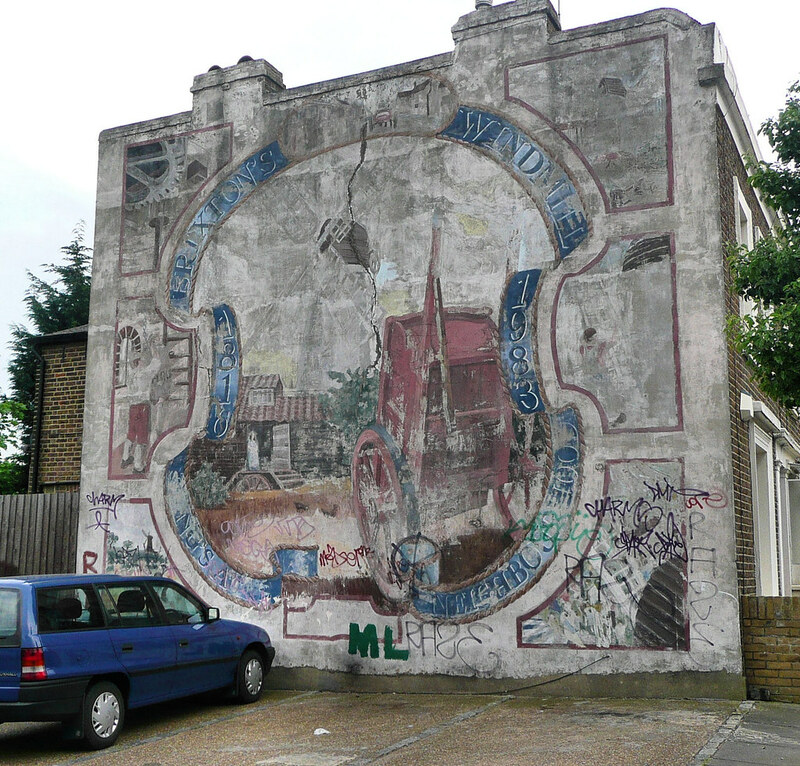 In the summer of that year, they worked with Jane Gifford and Ruth Blench on the Mauleverer Road mural, near Brixton Hill, while waiting for confirmation that a grant to paint the Windmill mural had come through. Once the money came, they left the Mauleverer Road Mural and travelled up the road to start the mural. The project was to include the help of local children and according to the artists, youth workers were to be sent to help out. However these people never turned up and so Mick and Caroline had to think of methods of working which would allow the children to help without extending the time they had to finish the piece or put the children at risk in any way. They managed to involve the young people and for many members of the local community, this was a mural they were particularly proud of and they felt some kind of ownership towards it. It was this that led to the reinvention of the mural in 2012 when local people came together to create a new mural, celebrating the local community, the old mural and the windmill. From Brixton Station, walk towards the Town Hall on the corner of Acre Lane. From here, take a bus and ask to be let out at Kings Avenue. Go up Kings Avenue and take the first Left. This is Lyham Road. Keep walking for about ten minutes - you will see the mural on your left hand side.